After the fascinating talk by Sam Cook the Nordkapp meet continued on the Sunday in less than perfect weather. Bouley Bay was our venue of choice as it offered the best chance of protection from the southerly winds, which were forecast to increase to force 7. Initially the winds were light and we were able to explore the headlands between Bouley Bay and Bonne Nuit, which are the highest in Jersey. Clouds were clearly building from the south and the wind increasing towards the forecast force 6 to 7. 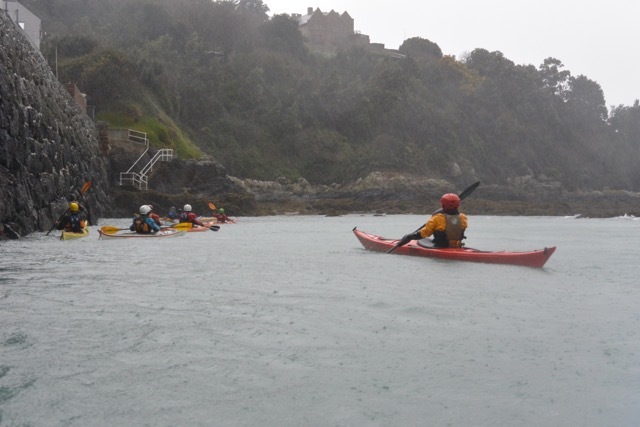 Certainly the paddle back into Bouley Bay was what could be described as entertaining. Although we had hoped for a day trip when we planned the Nordkapp weekend, the reality was the morning paddle on the Sunday was the best that could be hoped for in the conditions. Monday morning dawned brighter and slightly calmer so we were able to plan a day trip from the Jersey Canoe Club premises at St Catherine’s. Around the north east corner of the island and along the north coast, before hitching a ride back on the first of the flooding tide. It was amazing over these two days to see such a variety of Nordkapp sea kayaks on the water, performing perfectly in the environment they were designed to operate in. In the mid 1970’s Frank Goodman designed a sea kayak, with significant input from paddlers such as Sam Cook in particular. The first kayak was produced in February 1975 and in the following 43 years it has maintained its position at the forefront of sea kayaking expeditions. Last weekend was a celebration of the Nordkapp and in many ways the early years of the Jersey Canoe Club. Paddling Nordkapp’s members of the Club completed the first circumnavigation of Ireland, a circumnavigation of the Outer Hebrides, the west coast of Spitsbergen and our own Nordkapp expedition to name just a few. This was in addition to ground breaking exploration of the Channel Island waters by sea kayaks. Members of the Club continue to paddle at a high standard in a range of geographical locations but these trips are no longer the preserve of the Nordkapp alone. Times have changed but we still maintain our respect for this iconic sea kayak, which has contributed so much to the history of modern sea kayaking. Heading east around Belle Hougue. We were sheltered from the wind but from the clouds it was clear that things were going to get lively. Arriving back in Bouley Bay on the Sunday morning. Fort Leicester, visible above the bow of the kayak, was rebuilt in 1836 and is available for rent from Jersey Heritage. Monday’s lunch spot was taken on a small beach just to the west of Vicard Point. The small Canoe Club cottage at Egypt is visible at the foot of the cliffs across the bay. On the return paddle to St Catherine’s we stopped off to play in the tide race at Tour de Rozel. An exciting way to finish a superb weekend. The final paddle of 2017, for the Jersey Canoe Club, was from Bouley Bay. Once again the possible venues had been severely restricted due to the very unsettled weather. As it happened our time on the water coincided with a slight reduction in the wind speed, but this was due to luck rather than judgement. In contrast to most Club paddles we decided to paddle in the small kayaks, as opposed to the normal sea kayaks. Heading west, initially, we reached the small Canoe Club cottage at Egypt and the headland at Belle Hougue. As soon as we arrived at the headland we started to feel the impact of the rather large swell, which was arriving from the west. Returning back to Bouley Bay, we made a slight detour to try and see the remains of the ship, Ribbledale, which was wrecked on the rocks, just after Christmas 1926. Due to the swell it wasn’t possible to approach that close to the remains. It was another grey day, the 12th in a row, if my memory serves me correctly. Although it was a very entertaining final paddle for 2017 lets hope that 2018 brings an improvement in the weather. 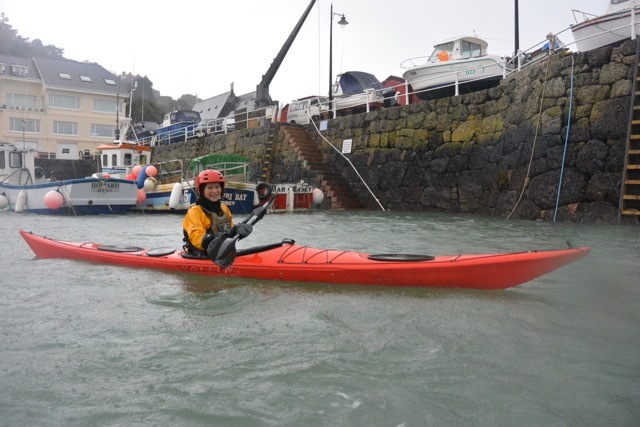 Rachel paddling along the outside of Bouley Bay pier with Fort Leicester behind. Fort Leicester is available for hire as a residential property from Jersey Heritage. Close to Egypt. The small cottage, Wolf’s Lair, is just visible above. A popular venue for members of the Jersey Canoe Club. There was some rather choppy water in close to the rocks near to Belle Hougue. Angus caught just inside the break. Timing was crucial when passing through some of the gaps. Dave surfing one of the waves as it wraps around Les Sambues rock. On other days a great tide race develops over this reef. Angus appearing to paddle uphill as the swell sucked back. Part of the remains of SS Ribbledale, a ship which was wrecked in the bay on the 27th December 1926. The spray shooting out of the top of the boiler was spectacular at times. 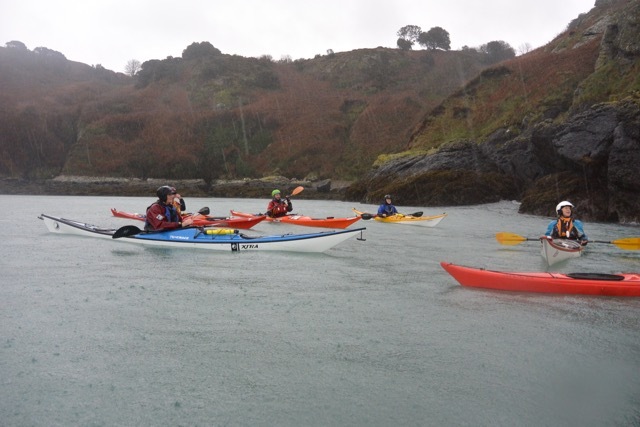 The forecast for the next few days is anything but favourable so we took advantage of today’s brief respite from the storms to get a paddle in, from Bouley Bay. Towards the north east of the island it is relatively sheltered from the strongest of the wind. With a weather forecast like this it was obvious that today was the day to get on the water, if we wanted a reasonable paddle. The most positive aspect of paddling at Bouley Bay, though is the gradient of the beach. Being relatively steep it means that the carry to the waters edge is always pretty short, this was certainly the case today as we only had a 4.7 metre tidal range. 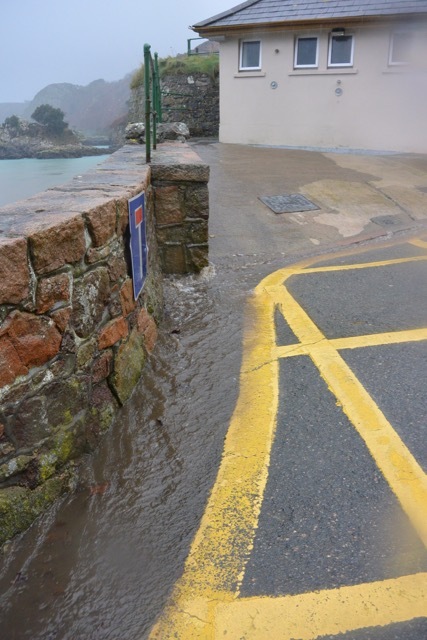 Although large compared to most places, for Jersey it was a small neap tide. The plan was to head east towards Rozel, hopefully for coffee and cake at The Hungry Man before returning along the coast. A fairly easy 6 mile round trip, particularly when we added a slight detour towards Belle Hougue. 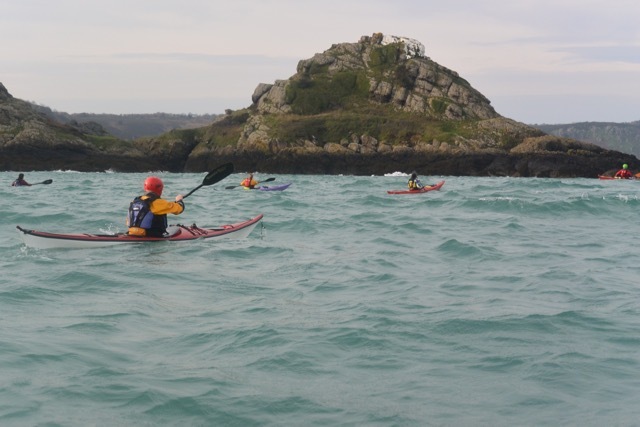 As with so many places, kayaking in Jersey is set against a backdrop of historical and geographical features. 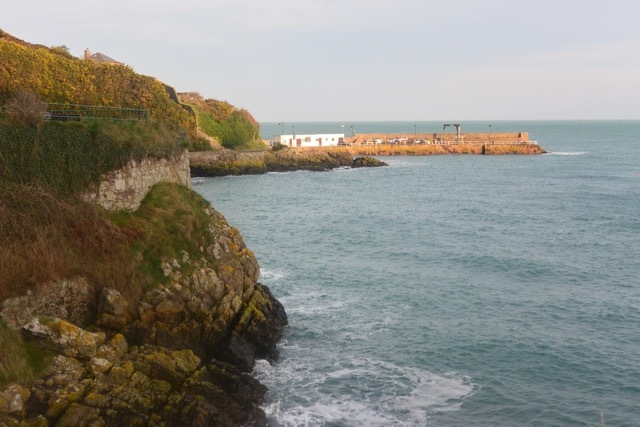 The small pier, at Bouley Bay, was built by the States of Jersey in 1829, as a small harbour for the oyster fishermen, who mainly worked off the east coast of the Island. The lack of flat land nearby prevented the development of a significant harbour in the area, although it was considered at times. Heading east, if the tide was lower we would be able to see the remains of the Ribbledale, a cargo ship, which ran aground on the 27th December 1926, whilst en route to Jersey from London. Today we just paddled over her remains whilst heading towards L’Etacquerel Fort. Constructed in the 19th century to help defend the bay, it is now available for hire from Jersey Heritage, it is ideal for visiting groups. From here we were carried on the tide towards Tour de Rozel, or White Rock. The location of many happy hours paddling by members of the Jersey Canoe Club, but today we didn’t hang around, we had more important things on our mind, coffee and cake at The Hungry Man, in Rozel. Fortunately for us it was open. The return journey was slightly longer as we wanted to get an extra couple of miles towards the British Canoeing Winter Challenge. A very plasant 3 hours out from Bouley Bay, made all the more worthwhile when the weather forecast was updated this evening and is now showing winds stronger than shown on the forecast above. certainly a case of “seizing the day”. Just to the east of Bouley Bay is L’Etacquerel Fort. Built in 1836 to help protect the bay it is now available for rent as basic residential accommodation from Jersey Heritage. Not easy to access by kayak, it is still a great place to stay. It is always worth looking backwards, occasionally. This was the view as we left Bouley Bay this morning. The Hungry Man at Rozel is a Jersey institution. Hot Chocolate and fruit cake were the order of the day. One of the most significant tidal races in Jersey develops off this headland at the start of the flood tide. 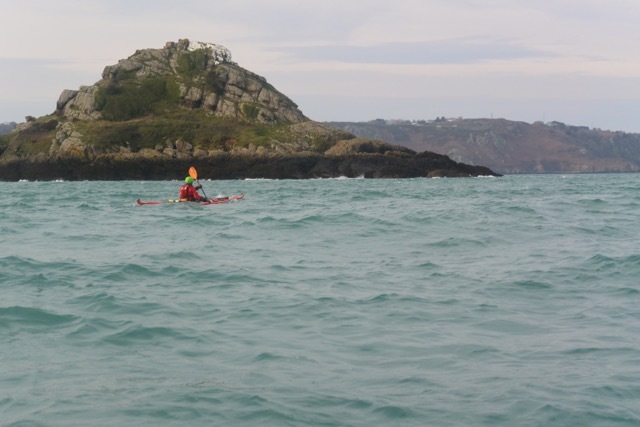 We had missed the fastest moving water and so were able to work away around the headland back into Bouley Bay. Paddling around White Rock against the last of the main flood tide. In the distance can be seen Belle Hougue, which was the furthest point we reached today, before heading back to Bouley Bay. The forecast for Wednesday was for southerly gales building during the course of the day, with the main impact being felt from about 15.00 onwards. Wednesday is the day when we try to go on day trips so we didn’t want to give up to easily. An option appeared to meet at Rozel, head west, use the tide, tuck in under the cliffs, eat our sandwiches and make a hasty retreat to the east before the full force of the gale struck. What was a real surprise was the stunning November sunshine we enjoyed all day, it was only on the drive home, as the wind speed significantly increased that the cloud banks started to move in from the west. Lunch was at Bonne Nuit, somewhere we hadn’t expected to reach when we set out from Rozel. Possibly the most interesting incident during the day was an encounter with a grey seal, close to Bouley Bay. The toggles on my Nordkapp are carved from reindeer antlers I collected on a trip to Svalbard in 1983. Clearly they attracted the attention of the seal, which was attempting to lick the toggles, sadly it was the rear toggle it was interested in. Meaning that it was difficult to see, let alone photograph. Still a memorable encounter. Approaching Egypt. 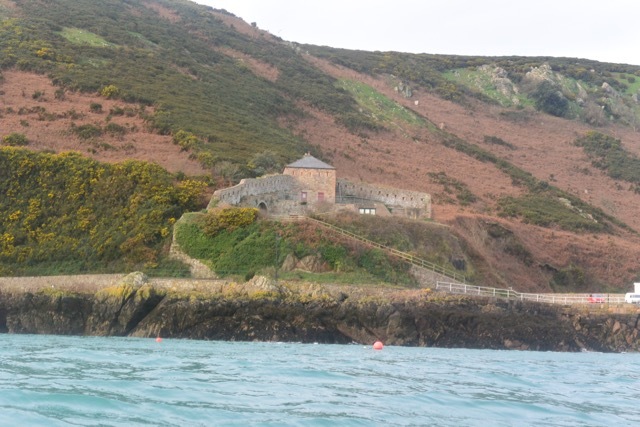 A delightful cottage between Bouley Bay and Bonne Nuit, which is looked after by Jersey Canoe Club. We weren’t certain that we would reach Bonne Nuit, but it was where we eventually had lunch. La Crete Fort now available for holiday accommodation from Jersey Heritage. 4 of the 5 kayaks in the photographs are Nordkapps. 1 is a classic Nordkapp HM and 3 of the plastic variety. Approaching Belle Hougue from the west. Belle Hougue is the tallest headland on Jersey and today we appreciated being able to shelter from the southerly gales, under its cliffs. Jersey’s North Coast with Manchester CC. 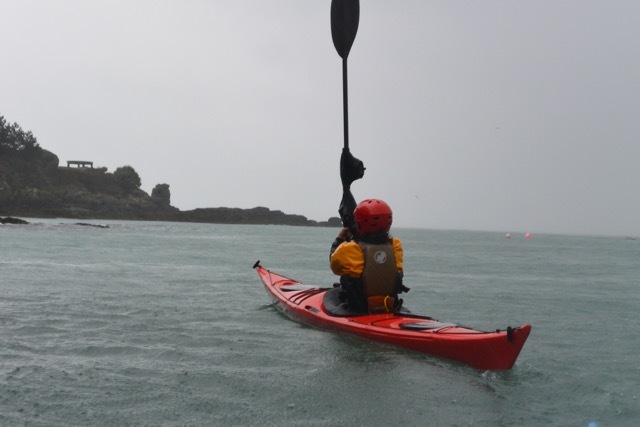 Attracting canoeing and kayaking Club’s to paddle in Jersey has always proved a challenge. The concept of flying to a weekend’s paddling has been difficult to promote, although over the years Tower Hamlets Canoe Club have become annual visitors. This year at the Spanish Sea Kayak Symposium we fell into conversation with Jim Krawiecki and suggested that a group from Manchester flew south to warmer waters and experienced some of the paddling which Jersey has to offer. After a quick paddle along the south coast yesterday using equipment courtesy of Absolute Adventures, today’ s focus switched to the north coast of the island. 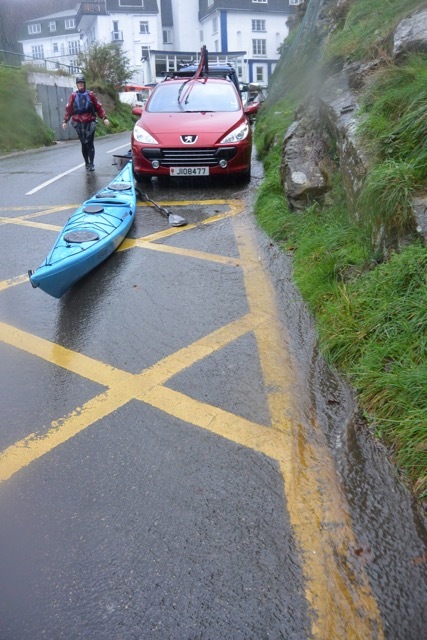 Meeting at St Catherine’s, were the Jersey Canoe Club has its premises, the plan was to head west on the ebbing Spring Tide before returning back to St Catherine’s as the tide started to flood. Along the way we hoped to be able to introduce the Manchester Canoe Club members to the delights of some of the Jersey tide races. Remaining the tidal flow during the morning, we paddled from point to point, which meant that we were a significant distance offshore. The advantage was that our speed over the ground rarely dropped below 6 knots. St Catherine’s, La Coupe, Tour de Rozel and Belle Hougue, one point after another, passed quickly. Paddling around the end of St Catherine’s Breakwater, some tide was still running north, contributing to our 7 knots over the ground. Passing White Rock on the ebb. On the return the tidal race would be running and the water would be slightly more entertaining! There was still some movement off Belle Hougue, our final headland before lunch at Bonne Nuit. Sark is just visible behind the paddler. Lunch was on the beach at Bonne Nuit. The last of the ebb tide was still flowing west when we started our return paddle so we stayed close to the shore initially, passing things that we missed whilst heading in the opposite direction. Remains of the ship SS Ribbledale, which was wrecked on the 27th December 1926, whilst en route from London to Jersey. 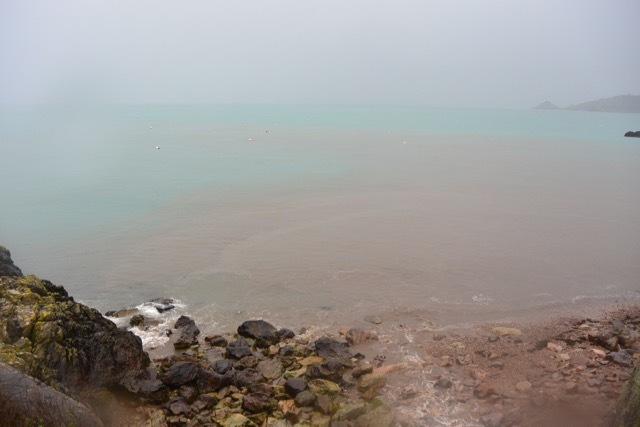 This is visible just to the east of the beach at Bouley Bay at low water on Spring Tides. As the tide drops some isolated beaches appear around the coast of Jersey. Our final play of the day was in the moving water at Tour de Rozel before we jumped on the tide and hitched a free ride back to St Catherine’s. Sprinting off La Coupe we managed to reach 8.3 knots over the ground, not a bad speed on what was supposed to be a relaxing days paddle, introducing some of the members of Manchester Canoe Club to the variety of sea kayaking that Jersey has to offer. 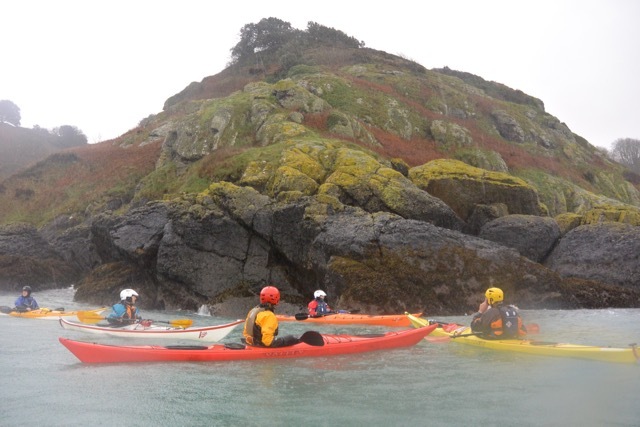 Belle Hougue is possibly the most dramatic headland on Jersey and offers superb sea kayaking for the discerning paddler. The tide race, which forms on the ebb is probably my favourite on the whole island. It is the tallest headland in Jersey and a considerable race develops here on both the flood and the ebb. If there is any swell running then the waves can break heavily over the offshore reefs. The area around Les Sambues is probably the most interesting for those in search of white water excitement. Fast moving water pours around the rocks when they are uncovered and stationary surfing waves form when they are submerged. In close at Belle Hougue there are numerous passages to be explored and at the western edge of the headland is Belle Hougue cave. Access is difficult from the land and when it was first known to have been entered, in 1914, it contained stalagmites and stalactites. Inside there have also been discovered the antlers, teeth and bones of a small species of deer which is unknown anywhere else. Belle Hougue is a dramatic and awe inspiring location which demands respect in certain wind and tidal conditions. It is also often the first place that the effect of the swell can be felt when you are paddling west along the north coast. Belle Hougue seen from close to Bonne Nuit, the small harbour to the west. The coastal footpath is clearly visible descending diagonally. Starting to surf on the front wave. Tour de Rozel is the headland visible in the distance. This photograph was taken in the same place as the one above but on a day with different water and light conditions. The main difference is that there is a slightly larger swell on this day. Looking west towards the main headland. Belle Hougue cave is close to the base of the cliffs where the obvious skyline reaches the water. Threading through the channels close in shore. On days with a big swell this area challenges the skill level of most paddlers. Belle Hougue seen from above just after take from Jersey. Belle Hougue is one of those headlands which I never tire of paddling around. The water is often entertaining even on the calmest summer days. Today was one of those days when it would have been so easy to stay in bed or to go to the gym, but it was well worth making the effort to head out in to the rain. With strong winds from the south blowing the north coast was the only really viable option. Bouley Bay to Rozel and back. A good run out for my first paddle of the year. Kate inside Rozel Harbour. Just about to head back. Kate trying to get a bit of help from the following wind. The north side of the harbour wall provided some shelter from the strong offshore wind. 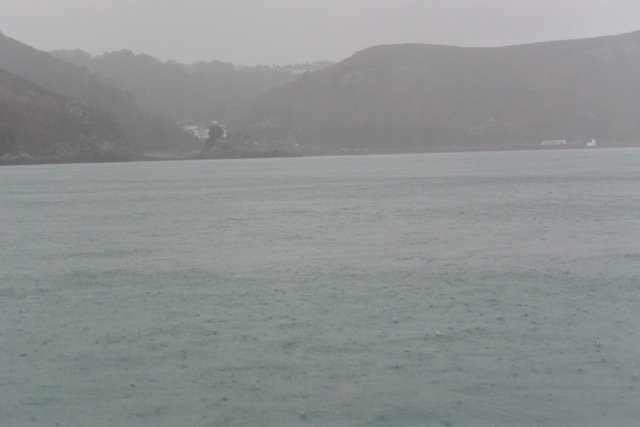 At times the rain was so heavy that it obscured the finer details of Bouley Bay. Water was running down the road with some considerable force and then amazingly after we had tied the kayaks on the cars the rain stopped and we were able to get changed in the dry! 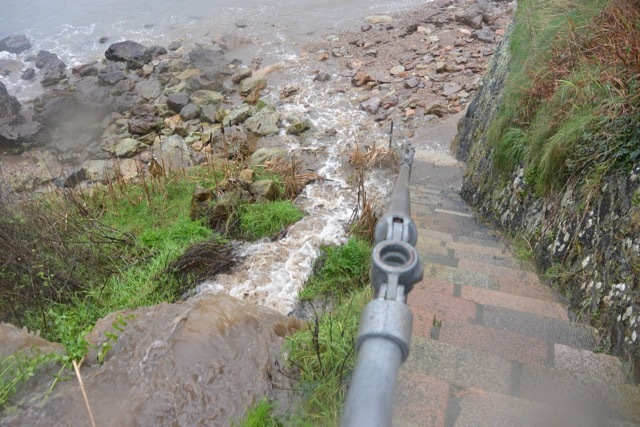 Water pouring down the steps and onto the beach had discoloured the sea. After a Christmas break away from the Island it was good to get a quick paddle in today. The south easterly force 6-7, which was forecast, plus the rather large westerly swell reduced the options but Bouley Bay on the north coast seemed ideal for a couple of hours out on the water. For the last paddle of the year it proved to be a pretty reasonable choice. The small pier was constructed in 1828, although there had been earlier plans to construct a much larger harbour in the area. This project was dropped due to the lack of available flat land to build on. 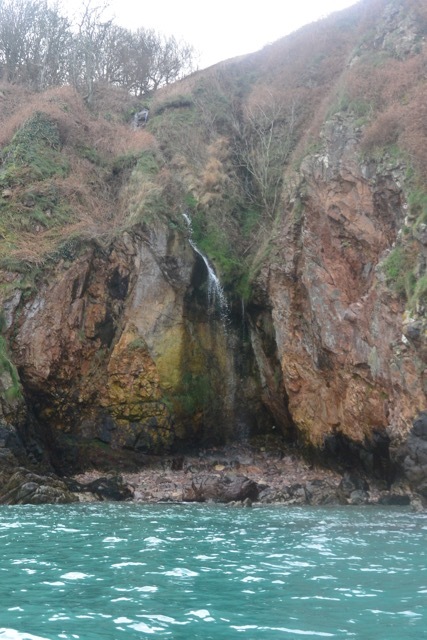 The heavy rain of recent weeks has resulted in a few seasonal waterfalls appearing along this section of coast. Alex approaching Tour de Rozel, the wind was pushing us along quite nicely. Tour de Rozel is one of the iconic landmarks of the north coast of the Island. On the flood a delightful tide race develops, which has provided hundreds of hours of entertainment to local kayakers, over the years. Here are a few pictures taken 5 years ago. Fort Leicester dominated the western side of the bay, rebuilt in 1835 it is now available for hire from Jersey Heritage, as a rather unique place to stay.